Robert Lyon Lichten, the Society's 22nd president, its board chairman in 1966-67, and a founding trustee and later chairman of the Board of Trustees of the Vertical Flight Foundation, died Sept. 18 a few hours after an automobile accident south of Waco, Texas. Lichten, 50, was director of advanced engineering at Bell Helicopter Co., Fort Worth, Texas, and was one of the few holders of the Society's top engineers award. This aeronautical engineer was the first to recognize the potential of the VFF, an independent and charitable trust formed in 1967. AHS President Howard N. Stuverdue described Lichten's death as a "tragic loss, not only to those who loved him as a human being, but also loved him as a human being, but also to the profession to which he devoted his exceptional talents and farsightedness. His was tireless in his efforts to advance rotary-wing technology, and generous in his contributions to the technical literature, to affairs of the Society, and to the Vertical Flight Foundation. His passing leaves a void in the vertical-flight aircraft industry and I am sure every member of AHS joins me in offering condolences to his family and associates." 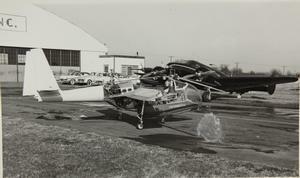 Lichten's enthusiasm for rotary-wing flight was as intense as it was of long dureation. (He was a research assistant at MIT's Flutter Laboratory for a year ending in 1943, just before receiving his BS in aeronautical engineering from that institute). But it came to the fore only at times he considered most appropriate and it seemed to the experienced observer, when his convictions might have maximum persuasiveness. 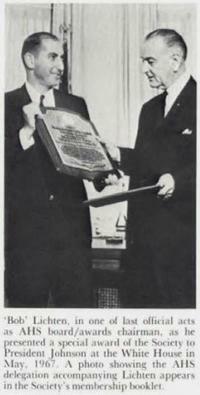 One of these occasions was in May of 1967 when, as AHS chairman of the board and awards chairman, it became his responsibility to present to President Lyndon Johnson the Society;s special award (a plaque) honoring the first family as "The World's Leading Helicopter - Using Family." In a letter accompanying the award he wrote President Johnson: "This recognition is particularly appropriate in that you were the first prominent public official to use rotary-wing aircraft to bring your message to your constituency. 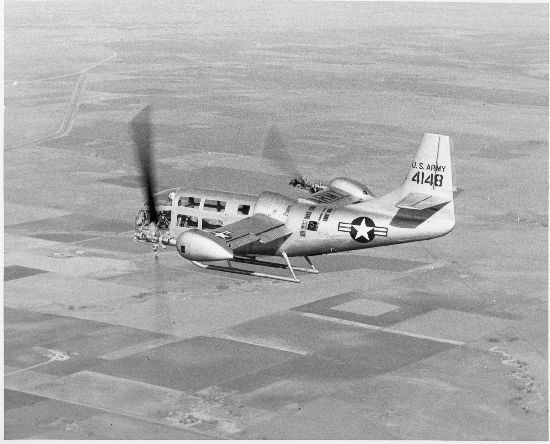 Further, from your original helicopter flights of early 1948 to the present day, you and Mrs. Johnson have consistently utilized these versatile aircraft as a safe and convenient means of transportation. The confidence in helicopters that you have evidenced as contributed greatly to the large-scale acceptance of this mode of air travel in the US and abroad." Lichten was considered one fo the world's outstanding engineers in the field of rotary-wing aeronautics. 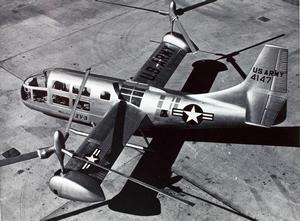 In 1959 of the Society's ighest engineering honor, the Klemin Award, was presented to him for his role in development of Bell's XV-3 converti-plane. He was responsible for the design of all intitial development versions of the military UH-1 (Huey) and of the light turbine JetRanger helicopters of Bell. Lichten's responsibilities at Bell included preliminary design, R&D, aerodynamics, dynamics, engineering computing and reliability, and experimental aircraft projects. He joined Bell Aircraft Corp. (now Bell Aerospace Co.) in Buffalo, N.Y., in 1948, then went to Texas with Bell Hellicopter, in 1952. The AHS approved his application for membership on April 23, 1951. At that time, he was also a member of the Institute of Aeronautical (later Aerospace) Sciences and several of his technical papers had been published. At the time of his death he also held te membership in AIAA and had served on technical committees of that society and of the NAtional Aeronautics and Space Administration. Lichten held many positions in AHS aside from the presidency. In a one-year period beginning late in 1956, he served as editor of the then new Journal of the American Helicopter Society - its second. He also served a term as secretary-treasurer of the Society. An AHS annual award is now made in his name.